As Techo day approaches, the minds of Neopians everywhere turn to famous Techos across the globe, such as the Techo Master, Dr. Death, and that crazy Techo Fanatic who pierces everyone's poor eardrums at the Altador Cup. However, one Techo often overlooked is the Tropical Foods shopkeeper on Mystery Island. 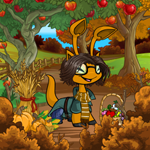 This week, as promised, I’m strapping on my moon shoes and heading to Kreludor, Neopia’s only moon, to try the most recommended restaurant by all my Grundo buddies- Cafe Kreludor!